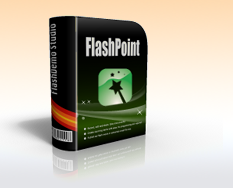 FlashPoint is a powerful PowerPoint plug-in let you convert PowerPoint to flash.easy of use, accurate conversion, and small size; keywords:PowerPoint to Flash, ppt to swf. Fully functional version, for personal, education and non-profit org. only. Create professional-look flash presentations and e-learning courses with PowerPoint knowledge. Preserve narration, sound, animation sound effects. Compatible with PowerPoint 2007 ?? and Windows Vista ?? Retain original PowerPoint animations, slide transitions, timings, callouts, and shapes. Extract embedded flash movie (*.swf) from original PowerPoint and re-create it in the final flash movie. Qweas is providing links to PowerPoint to Flash Converter 3.10 as a courtesy, and makes no representations regarding PowerPoint to Flash Converter or any other applications or any information related thereto. Any questions, complaints or claims regarding this application PowerPoint to Flash Converter 3.10 must be directed to the appropriate software vendor. You may click the publisher link of PowerPoint to Flash Converter on the top of this page to get more details about the vendor.